The Hadrian’s Wall Long Distance Path became the UK’s 15th National Trail when it officially opened in 2003 and runs for 84 miles (135 km), from Wallsend in Tyne & Wear on the east coast, to Bowness-on-Solway in Cumbria on the west coast. 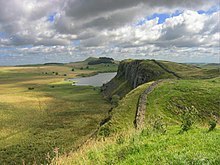 For most of its length the path runs close to, (and in some sections actually on), the remains of Hadrian’s Wall which was the defensive wall built by the Romans in AD22 on the northern border of their empire. The Wall is now on the UNESCO World Heritage List as part of the “Frontiers of the Roman Empire“. However some prefer to take a longer or shorter time, whilst still enjoying the wealth of historical interest and magnificent scenery en route. Hadrian's Wall Baggage Transfer Ltd using their 2 vans Romulus & Remus!